That mystery man who, we’re told, abused hapless Ahad Miah’s Facebook page by posting a salute to Hitler was also busy hacking into his Twitter account, it seems. 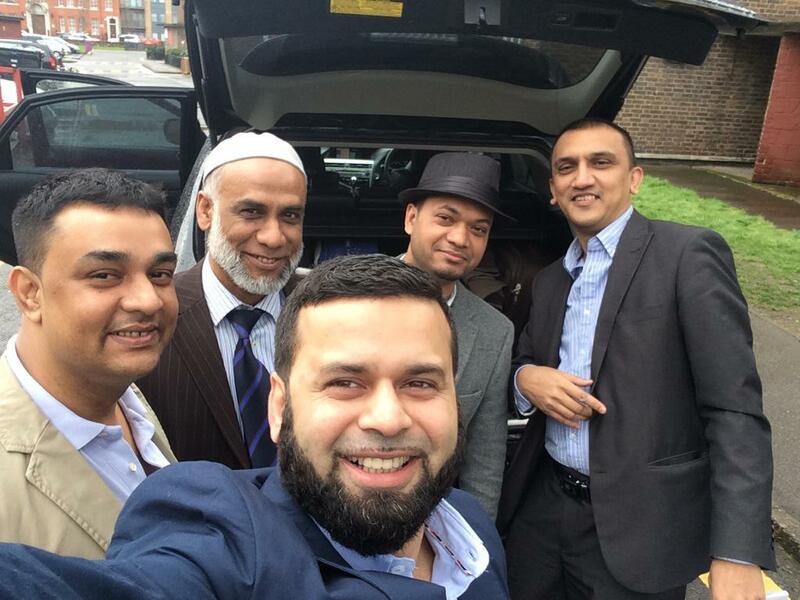 Miah, a Tower Hamlets First candidate in last May’s elections and a friend of several senior figures in that “party”, immediately found himself in hot water with Mayor Lutfur Rahman. I’m told he admitted to neighbours he’d been an angry man during the Gaza crisis last summer and that he may have done things he now regretted. 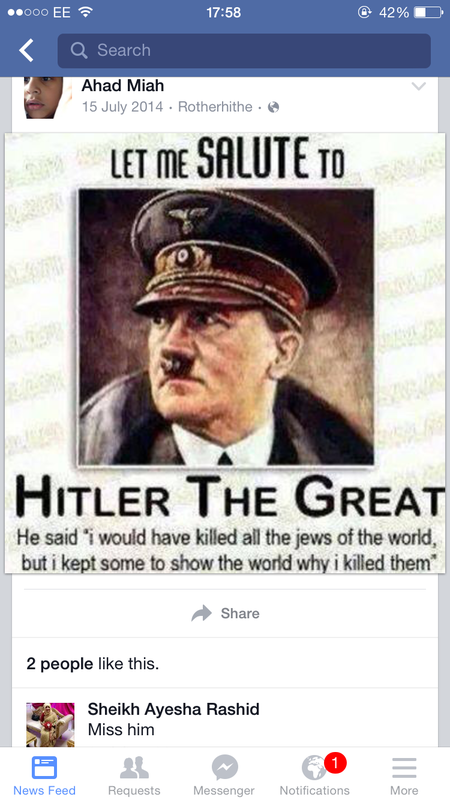 However, he then issued a statement on Facebook to say he had no idea how that picture got there. He said someone had gained access to his account. Not many, if anyone at all, believed him. I didn’t realise he also had a Twitter account. Perhaps he didn’t either. A reader of this blog sent me this Tweet that Miah posted on July 17, two days after that Facebook salute. But enough said on Miah; he’s now history and I doubt very much we’ll see him again trying to make his way in politics. The reason he popped on this blog was because he was part of a DCLG-funded weekend away in Suffolk discussing faith and “promoting integration” with the Salvation Army. You’ll recall that the weekend at Kentwell Hall was paid for by a £2,000 grant from the Near Neighbours fund, which is from a DCLG pot and administered by the Church Urban Fund. A weekend away to deepen relationships, build understanding and develop plans for future working for 15 leaders from Stepney Salvation Army, Stepney Father’s Group and The Stifford Centre. 1) Leadership development. The project will develop the capacity of individuals in each institution to work together with others for positive change in Stepney. 2) Cross-institutional relationships. The project will help to build a better working relationship between the Salvation Army, Stepney Father’s Group and The Stifford Centre on issues of shared concern. 4) Influence beyond Stepney. Our desire for the ‘film’ is to share our project with Muslims and Christians outside Stepney and to raise aspirations about what can be achieved in UK communities. Captain Nick Coke – co-leader of The Salvation Army – has 12 years of experience living and working in Stepney. He has built a Salvation Army congregation in Stepney from scratch, is a co-chair of the Tower Hamlets branch of Citizens UK and has a proven track record of building relationships with people of all backgrounds and faith in Stepney. Ishaque Uddin – leader of Stepney Father’s Group – has lived in Tower Hamlets for 25 years. He founded the group 10 years ago, has previous experience of inter-faith initiatives in Stepney and has been trained in community organising. They will be supported by secondary leaders in their institutions and by the director of the Stifford Centre. In my original post on Sunday I said the trip to Suffolk involved the Sally Army, the Stepney Fathers and the Stifford Centre. I said those three groups had been meeting for some time and that they had played badminton and socialised generally. Well, the Stifford Centre trustees have been in touch and they’re really very angry. They say they’re not Bengali dominated (they are). They say they don’t have clandestine meetings (who mentioned clandestine? ), they say they’re “transparent” (really, see a few sentences later), they say they don’t play badminton with the others….and that none of their “representatives” were on that weekend away. This email came from Salman Alam and Ahbab Miah. The latter is the centre’s committee secretary, while the former is the centre’s director–the man Nick Coke said was supporting the grant application. We were consulted a long time ago by Salvation Army/Stepney Fathers Club representative about a possible Near Neighbours project involving a weekend away day and while that was an aspiration of the project, we had not heard more about the project development. I asked them to be more specific about “a long time ago”. They said they “were unable to comment any further on this matter” and that they’d publish a statement in due course. That’s transparency for you. I also asked Nick Coke for an explanation. I asked whether any Stifford people had been on the trip, whether his grant application had been made on a false premise, and why the venue had been changed from Devon to Suffolk. He said he’d been told to refer all questions to the Church Urban Fund. I’m awaiting their response. Maybe they need a weekend away to work it all out. As for extended breaks, there might be a few in need of those after tomorrow’s Election Court verdict, which comes at 10.30am. for 1st Muslim executive MAYOR of Britain. The commissioner has decided that the judgement will be given tomorrow Thursday. He will disclose the decision on Thursday and has not given any indication either way. He is the Master planer. The following is a guest post by Tower Hamlets deputy mayor Cllr Oliur Rahman about his trip to Greece last month. He went with fellow Tower Hamlets First councillors Shahed Ali, Mahbub Alam, Shafiqul Haque, and various trade union activists. I wrote about it at the time here. The verdict in the Lutfur Rahman trial is expected next week, according to my latest information. Should that judgment go against Lutfur, Oli could be acting mayor for a short period. Clearly there are discussions even among Lutfur’s Tower Hamlets First party about who might stand in any mayoral by election in the event of a ‘guilty’ verdict. They’re only human after all. As the General Election draws closer, this should be a time of excitement and interest in politics. But for many, the opposite is the case. Huge numbers of people feel alienated from the political process, cynical with politicians, and don’t see any real difference between mainstream parties united on wanting to slash public spending. As the rise of the SNP and decline in Labour in Scotland demonstrates, people want to shake up the political order. And not just in Britain.Nowhere is this more evident than in Greece which has recently seen the election of the left-wing Syriza party on a programme of tackling austerity. 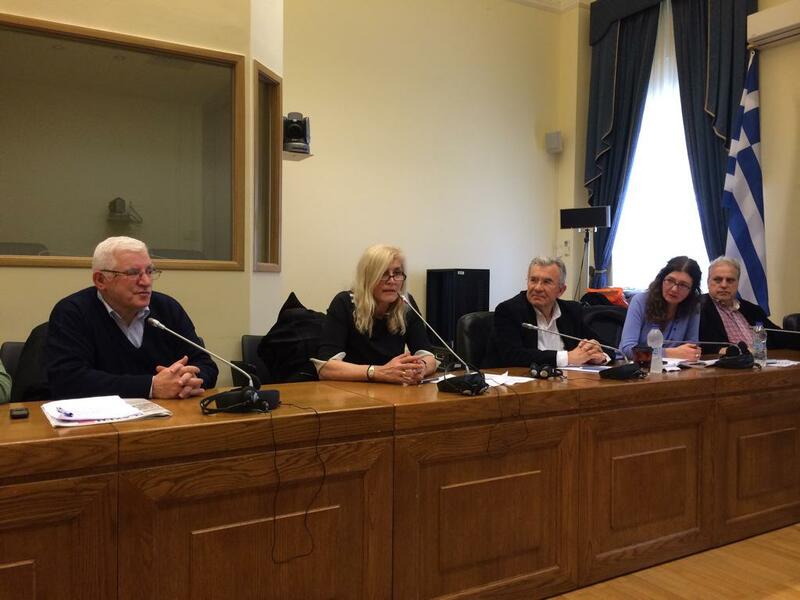 A few weeks ago I decided to lead the first ever British local authority delegation to Greece. I did so because I am committed to build European solidarity against the austerity that is destroying the lives of fellow EU citizens. But I went for another reason. I wanted to see up close what this new kind of politics that Syriza stand for actually meant in practice. On arrival our delegation – comprising of councillors, trade unionists and community activists – was taken into the Greek Parliament to meet with representatives of the International Aid Department. This was timely. The government was in the news for sticking to their pre-election commitment that they would not slash their international aid budget and ignoring demands from EU finance bureaucrats. It was refreshing to come across politicians who don’t actually pay lip service to humanitarianism, but put their words into practice. The message from the Syriza representatives was loud and clear: for the peoples of Europe to defeat austerity we need a strong European-wide anti-austerity movement. This message was repeated in our meetings with activists in our visits to two social centres – these are citizen-run health clinics, food centres and legal aid hubs which have emerged to fill the gaps left by austerity. The activists in the centre were at pains to emphasise that the aims of the centres is not about charity and just about helping people in desperate need. They are also about empowering citizens so that they can exercise power to shape and influence the political decisions affecting their lives. I was really impressed by the social centres and the representative from the Unite community centre on Cable Street agreed to look into twinning their centre with one in Athens. As we travelled around Athens it had the appearance that all is well. The cafes were full, there seemed to be a buzz in the shopping malls. You see people sleeping in the streets but you do so in London too. However underneath the surface the figures tell a level of crisis much more severe than here. It is estimated that half the population are below the poverty line. Household incomes have fallen by a third since austerity hit. Many of those queuing at food banks belonged to the upper middle classes not so long ago. Politicians with reactionary politics and simplistic solutions have done well in response to the crisis, and none more so that Golden Dawn, an openly neo-Nazi party that has scored up to 15 per cent in the opinions polls and whose members have been complicit in racist assaults and murder. They have made their gains on the back of trying to scapegoating migrants. The reality of the impact of racism was brought home to us in a meeting we had with the anti-racist and anti-fascist organisation KEERFA which gathered together African, Pakistani and Bangladeshi members of migrant rights organisations. Their plight had been highlighted recently over the case of 35 illegal strawberry pickers who were shot at by their farm guards for asking for pay that was five months overdue. Shockingly, when the case went before a court the guards were responsible were acquitted. We were privileged to meet with one of the leaders of the fruit workers, Tipu Chowdhury, whose testimony about their plight was very moving. We agreed we would organise a fundraising dinner in support on our return.The issue of the lack of basic rights for migrants was one that came up a lot on our visit. The local Bangladeshi community organised a dinner in our honour with over 200 people crammed into a tiny restaurant and we met members of the Greek Bangladeshi community who have been living in Greece for decades but still had not citizenship rights. As with all the Greeks we meet on our visits, the warmth of their welcome was overwhelming. Hearing that we were in town we received a call on the eve of our departure from Athens from Zoi Konstantopoulo, the most senior woman in Greek politics, a human rights lawyer who sued Britain over the Iraq War, and Syriza’s President of Parliament asking us to come see her. We were honoured to meet her and were all impressed by her easy, relaxed style – she insisted we address her by her first name – and her lack of the airs and graces. Zoi talked about how five years of austerity had strangled the Greek economy, the importance of building an international solidarity movement and the new government’s commitment to tackling racism. The Greek parliament has already made commitments to improving rights and Zoi affirmed the government’s commitment to redress this issue. I know I am speaking for everyone on our delegation in writing that our trip to Greece was a really positive experience. It demonstrated the determination of the new Greek government to challenge the austerity agenda wreaking havoc in the EU. I am came back from my trip more committed to the idea of a European Union, but one that is a Europe committed to the interests of all its citizens. At first sight, this one is straight from Comedy Central. Greece is in a bit of a pickle. It’s had a bit of a problem with corruption, and with how its politicians spend public money. So who better to call in for a bit of advice than a special hit squad from Tower Hamlets? Here’s a tweet from Stepney’s Tower Hamlets First councillor Mahbub Alam. Where to start? As Private Eye’s Rotten Boroughs editor Tim Minogue remarked on Twitter last night….wtf. First, the hat. In the first picture above, it’s resting on the head of the deputy mayor, Oli Rahman. He says it was a gift from George Galloway. Indeed, he does look like a mini-George and Oli was once upon a time one of his Respect councillors in Tower Hamlets. In fact I’m told that Oli, like George, has also taken to cigars. I’m not sure if he’s started wearing leotards yet, but you never know. There are other links to Galloway with this trip as well. In that fourth picture above, showing a tasty meal in Athens on Thursday night, you can see sitting at the far end of the table on the left hand side as we look at it, Kevin Ovenden. A socialist philosopher mathematician, he was for very many years the left hand side of Galloway’s brain (the right being the slightly more creative Rob Hoveman). Kevin has been in Greece for some time and is no doubt excited by the rise of the Syriza party there, but I’m assured this Tower Hamlets delegation was not his doing. It was all Oli Rahman’s idea, Oli told me this morning. He called me from a Greek train slightly distressed after one of their wider group had just been robbed of their wallet. Yesterday, they all met a group of Syriza MPs in Athens, the party’s head of international affairs, a local mayor and a member of the Greens. As one Tower Hamlets politico said to me yesterday, it’s difficult to understand who exactly is advising who. However, while it’s easy and perfectly reasonable to mock and laugh, there is a serious side to this. Greece has a serious problem with racism and a growing one with fascism. Golden Dawn are neo-Nazis. Last year, there were cries of “scandal” after a Greek court acquitted two farmers of shooting 28 Bangladeshi migrants who had been claiming back pay for their strawberry picking work. Very good accounts of the story are here and here. Oli told me this morning there are some 700 Bengali businesses in Athens alone, many of which are struggling with the austerity measures. Oli thought that most of the Bengalis in Greece did not have Greek passports, merely indefinite leave to remain there. I asked whether any those he had met there wanted to come to the UK. He said if some were “given the possibility to, they would come”. However, he added many others simply wanted to pursue a life in Greece. He said the Greek MPs and the Greek Bangladeshi Chambers of Commerce wanted to hear about how the racism of the Seventies and Eighties in the UK had been defeated. Oli said the MPs were amazed and impressed that people of an Asian immigrant background had conquered such prejudice and were now running a major London authority. “They were fascinated about that,” Oli said. I asked Oli what he’d been most impressed with so far and he highlighted a movement set up by Syriza MPs called ‘Solidarity for All’. Each Syriza MP donates 20 per cent of their salary to it for humanitarian causes such as food distribution. That’s wonderful, I said. I asked him whether he and other councillors in Tower Hamlets would do that, ie donate 20 per cent of their allowances to such causes. At first he said the deprivation in Tower Hamlets was nowhere near the scale of Greece. I pointed out there were food banks crying out for money. I said he’d be setting a fine example. And then I think he got it. He said he would add a line to a motion he’s already submitted on the issues in Greece for the next council meeting. That should be an interesting vote. So something good might well come from their diplomatic efforts. Overall, good on them for going.